This notice contains information about Monster Strike Collaboration Event Dungeon: Keep of Catastrophe which is going to be added on 7/25 Update. New Boss, New Patterns will be added and you need a whole new different game style unlike before! 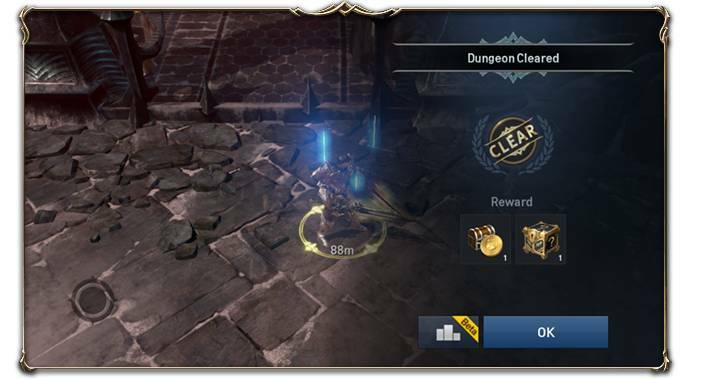 We’ll give you tips and information of this dungeon to help you clear it easily! As of this moment, there’s no equipment that has “Monster Strike” attribute. 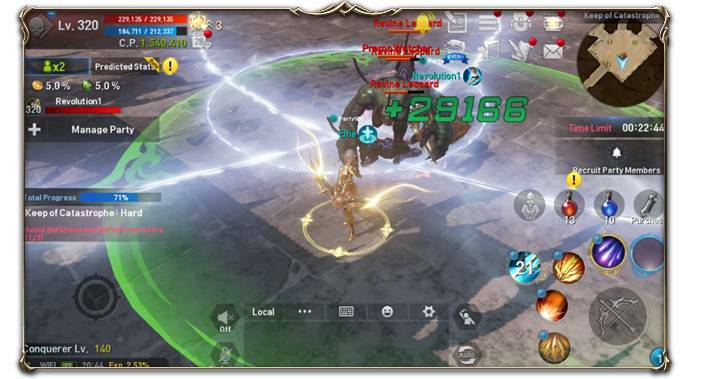 So, we recommend you, Heroes, to equip the highest grade of weapon and equipment that you have. 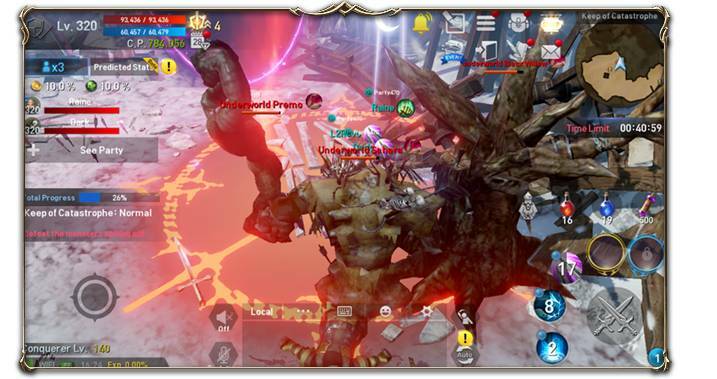 The Keep of Catastrophe’s difficulty can range from Easy to Very Hard and party members should enter the difficulty that is appropriate to the recommended Combat Power. 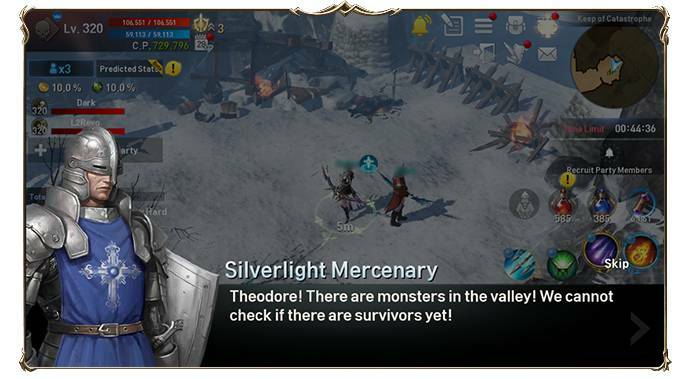 After entering the Keep of Catastrophe and while proceeding with the story, you might meet the missing Silverlight Mercenaries with Theodore. As you proceed with the story, you will be given a mission to defeat the monsters that appear at the gate. And because each of the monsters are strong, you need to take them to the magic circle that Theodore installed. In addition, it is better if you defeat the monsters as soon as possible because the magic circle that Theodore installed might disappear after a certain period of time. 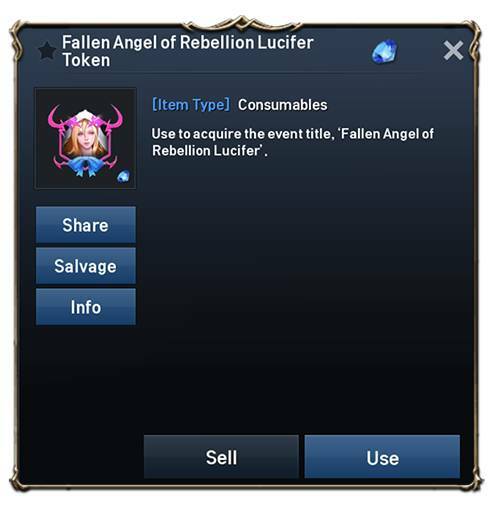 Fallen Angel of Rebellion: Lucifer uses various pattern of skills. • Celestial Light: Lucifer will emit a powerful beam from her fingertip. We recommend you to keep on checking the attack range of this attack because the beam is emitted in straight or linear of fan-shaped area. • Demonic Blasts: Psychokinetic beads will be scattered in all directions. You have to evade quickly to the blind spot areas where beads cannot reach. • Energy Circle: An Energy Circle will expand outwards in an AoE standard from Lucifer. 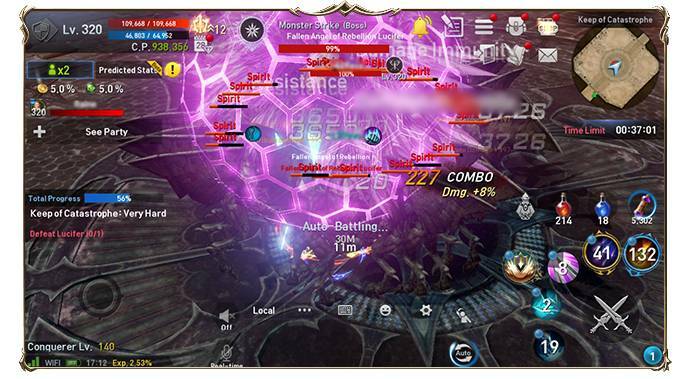 Upon reaching the maximum radius, the Energy Circle will explode, and will deal a massive damage. ※ This circle has a higher damage than psychokinesis. 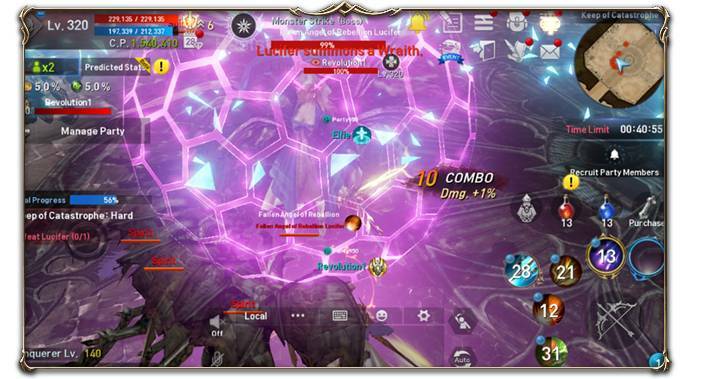 Therefore, we recommend you to evade this skill right away when Lucifer use it. • Barrier: Lucifer casts a [Mantle of Light] in her vicinity that reduces the damage that she receive from all attacks. 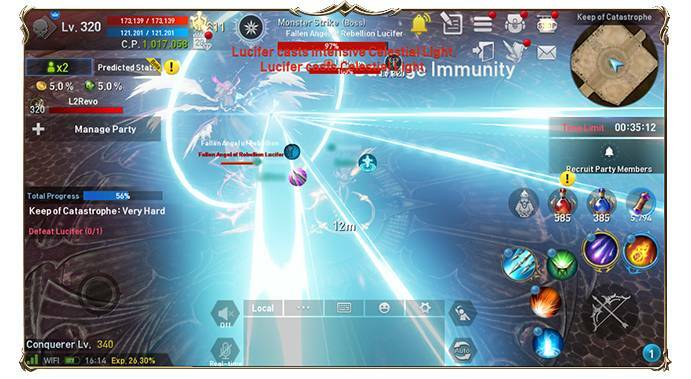 This [Mantle of Light] disappears after some number of hits but if you fail to remove it, Lucifer’s attack power will increase. So you need to remove it as soon as possible. 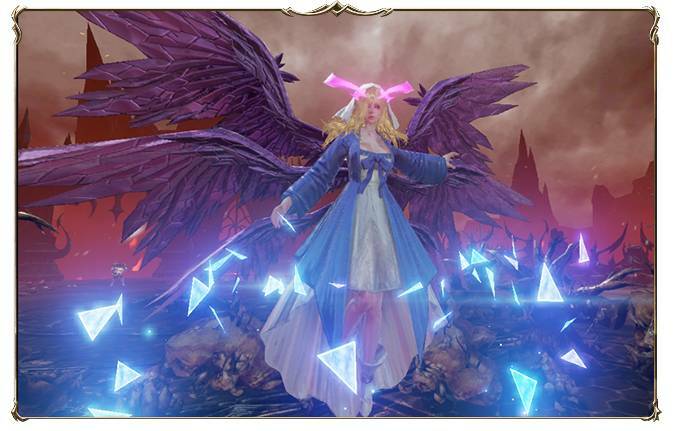 • Summon Wraith: Lucifer will summon many phantoms that can protect her while using Barrier. 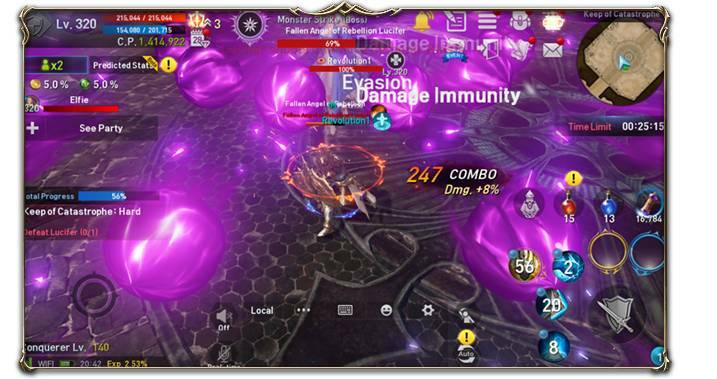 Phantom has low stats but they can interfere with you when you are trying to remove Lucifer’s barrier. When you are in the middle of the keep, entrance will be closed and dark areas will appear. We recommend you to enter with your party members because that entrance will close. You should defeat the monsters outside the dark areas because you will receive a big damage when you enter the dark area. Beware that the dark area will expand as time passes even though it started with a small area. 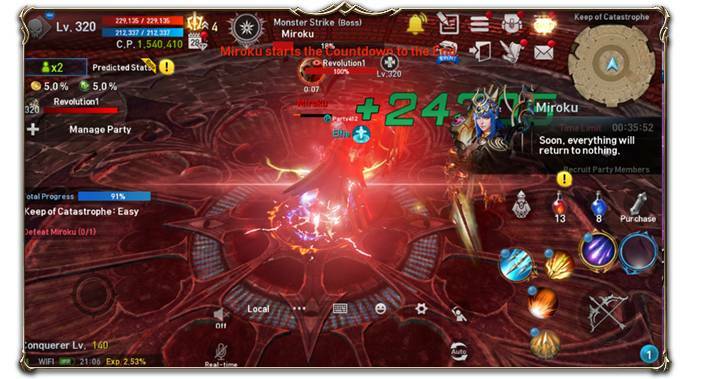 Savior of Cosmos: Miroku is the final boss in this dungeon that uses [Vajra] skills. • Wave of Enlightenment: Miroku sents out a powerful energy blast with a simple movement. Wave of Fusion’s range is fan-shaped and emitted 2 times. • Sphere of Ruin: Calls down bolts of lightning that destroy everything around her. It can deal a massive damage by summoning bolts after making a magic circle in a circular shape and Miroku is in the middle of it. • Summoning Vajra: Miroku summons Vajras and the summoned Vajras fight independently. Vajras have attack patterns that emit a light of beam but you can destroy it by attacking them. The summoned Vajras will be collected by Miroku if time passes after the vajras have been summoned. The number of Vajras that Miroku collects will change the effect of the END. • Empowered Vajra: It is a conditional type pattern after Vajra summoning pattern. Covers Miroku with Vajras that she collected and attacks to the front. 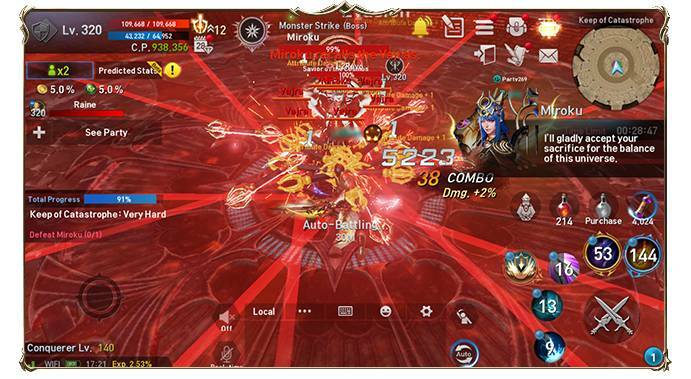 Attack Range and Damage can be decided depending on the number of Vajras that was collected. 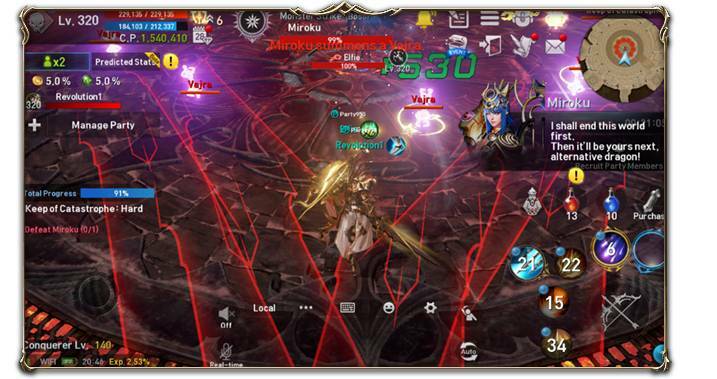 Take note that you can instantly be killed by the previous range or damage if your fail to destroy any Vajra. • Countdown to the END: Prepares to lead all life forms into oblivion. All living things in Miroku’s vicinity will meet their death. 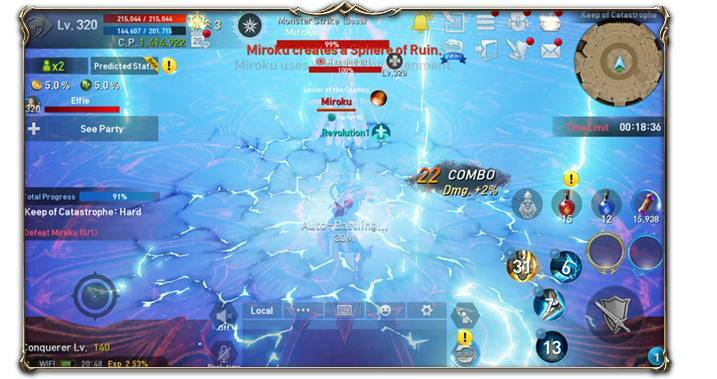 This skill will be used after 10 seconds and starts when Miroku’s HP goes down to 20% or more. Inflicting a set amount of damage to Miroku as she counts down to the END will prevent END from casting. The tip that we can give to clear Keep of Catastrophe is to use [Strikeshot], which is a consumable item. 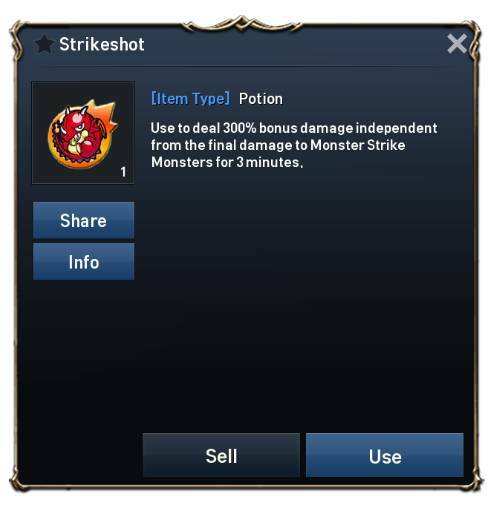 [Strikeshot] gives 300% additional damage to Monster Strike attribute monsters and that makes it a required item. 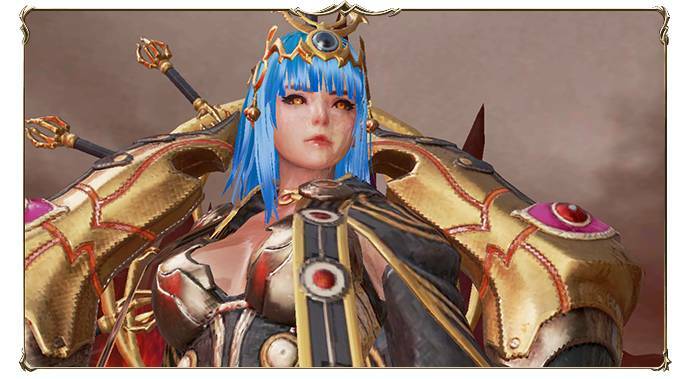 You can obtain [Strikeshot] when you defeat field boss [Acala] and [Queen Butterflight] that appears at Field Treasure Box. In addition, you can also obtain them from Keep of Catastrophe clear reward. If you think that the opponent is too strong and cannot finish it within 3 minutes, don’t worry as the[Strikeshot]’s duration is additive and can be stacked. Keeps of Catastrophe clear reward is divided into [Monster Strike Token], [Lucifer Core], [Miroku Core], and [Event Dungeon Random Reward]. 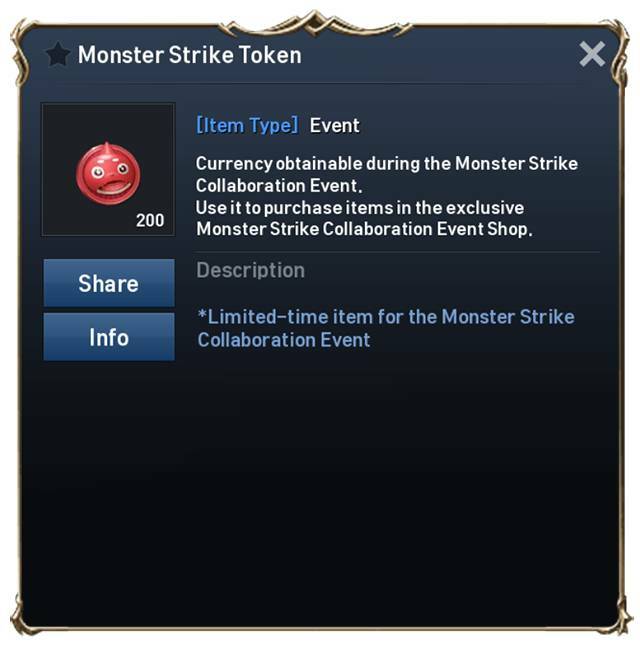 [Monster Strike Token] is a currency that can be exchanged with selling items in Menu > Event > Collaboration Event Shop. An unusual [Soul Stone] is sold unusually in Collaboration Event Shop, It uses the same pattern with Soul Crystals but it has a higher stats. We recommend you to purchase it to its maximum purchase limit. In addition, we do have [Monster Strike Collaboration Event Reward Box] that consumes the most number of tokens. We recommend this to those Heroes who have big interest with costumes because you can acquire Weapon Costumes from it. 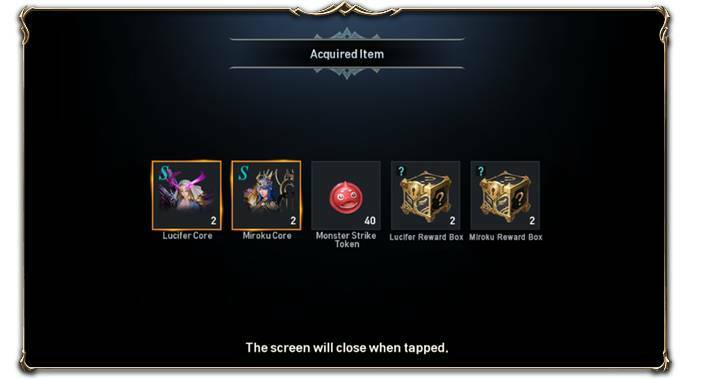 [Lucifer Core], [Miroku Core] are items that can be registered in Monster Codex. 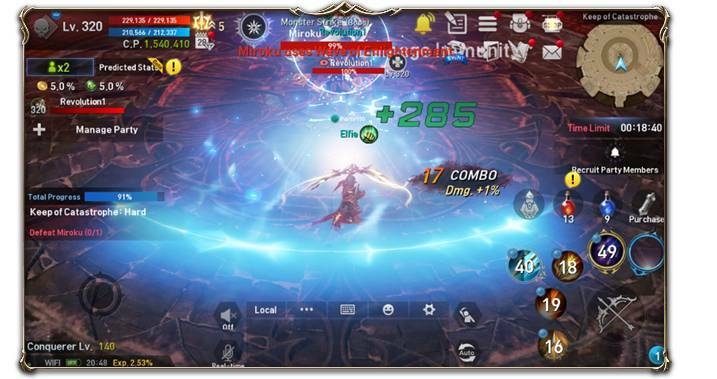 Same amount of cores will surely be distributed as a reward when you clear the Keep of Catastrophe Dungeon. 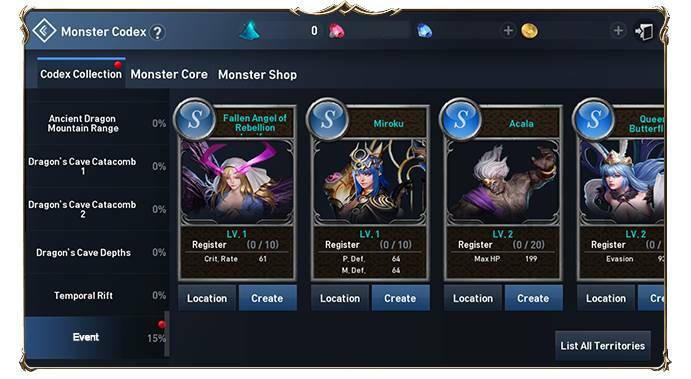 We recommend you to complete the Event Monster Codex that can increase your stats permanently before the event ends. [Event Dungeon Random Reward] is divided into Type A and Type B. 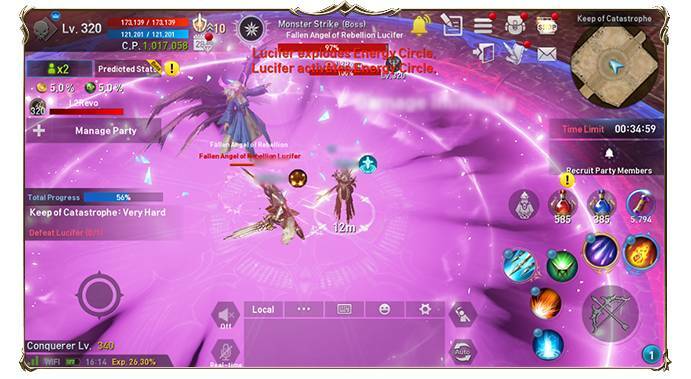 • You may obtain [Fallen Angel of Rebellion Lucifer Token] and [Lucifer’s Soul Stone] by chance in Type A. • You may obtain [Savior of the Cosmos Miroku Token] and [Miroku’s Soul Stone] by chance in Type B. Token can be a big help to increase your Combat Power because you can equip it and receive an improvement with your stats permanently. We recommend you to obtain this before the events ends. You may also obtain [Monster Strike Collaboration Event Reward Box] in both Type A and B. There you go, heroes! Defeat the enemies and enjoy the event that we have for you! 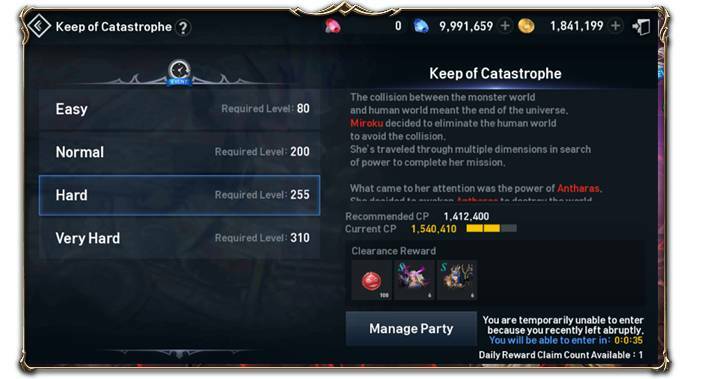 Hey Buddy!, I found this information for you: "[SEA] Tips and Information for Keep of Catastrophe Dungeon". Here is the website link: http://l2revolutionworld.com/sea-tips-and-information-for-keep-of-catastrophe-dungeon/. Thank you.